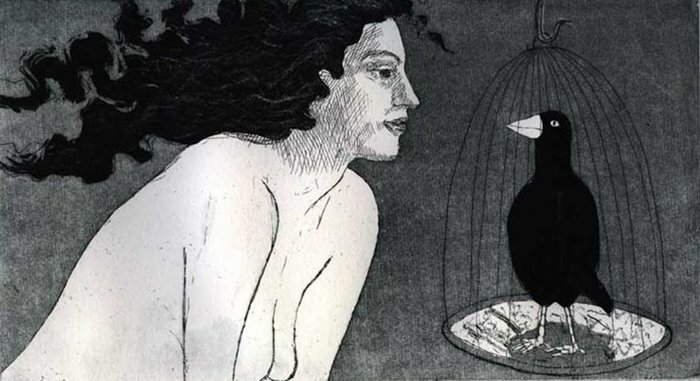 The following story was submitted in response to the writing prompt Bird and Girl, which featured and etching by Laura Robertson, shown above. When the music starts, she new it was time to rise. Pulling back the curtains, she saw a low line of blue mist rising gently above the soft green landscape beneath. The top of the sun emerged above this, deep orange emanating from its edges. The first smoke bellowed from the roof tops surrounding the tower, a ritual each day never lost. The bird continued to chirrup. She looked it in the eye, the bird going quiet. She watched it briefly before the door began to open. A guard came in with a bowel of fruit and some water. “You okay?” the guard asked her. “Yes, I am” she replied. “What?” the guard asked, looking her up and down. “Whatever, I’ll be back shortly”. He left quickly. She sat down on the bed, taking some papers out from under her bed. In there were some paintings she had done. It was the same horizon, in different colours, changing as the seasons had changed. Then there were some letters she had prepared for different people. She put them in a bag, hoping they would end up with their intended recipient. Soon the sun was out fully. She looked out at the landscape she had loved her whole life, saying goodbye to those things she would not see again. Their was a folly in the distance that had been such a good friend to her, the lake where she had watched her body grow, her horses enjoying the rising sun. She took a glance out of the window. The platform was in place and a crowd was forming. She went over to a mirror, combing her hair. Then the door opened. “Now, ma’am, it’s time” the guard informed her. She picked up the cage, the bird jumping around, unsure what was happening, and followed the guard down the stairs. They came to a large door, which opens, the sunlight burning on her eyes. Adjusting to the light, she saw the crowd, cheering and throwing their hats in the air. They went on to the platform. She saw the priest, and offered him the cage. “If you want freedom, you better hope that God will show you mercy” the priest told her. She leant down, putting her head on the block. The executioner took his place. The crowd went silent. Then the wings of a bird interrupted the silence, dancing through the sunlight. Dominic Bond lives in Sutton in Surrey and likes to write about the world he sees before him. 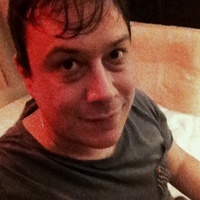 He says: “To me, there are few pleasures like a moment of inspiration.” Dominic has had poems appear on the Poetry Super Highway and Word Bohemia, and has had flash fiction published by the Pygmy Giant.